This Delicious Instant Pot Gumbo is a quintessential New Orleans dish that is hearty, satisfying, flavorful and perfect for a crowd. Made with chicken, sausage and shrimp, it’s a comforting dish that tastes wonderful when served over rice. Gumbo (along with jambalaya , étoufée, red beans and rice, and shrimp creole) is a popular dish that is an essential part of New Orleans and Louisiana culture and cuisine. Gumbo is a spicy, thick stew made with chicken, sausage, seafood and vegetables, including okra, and is served over rice. 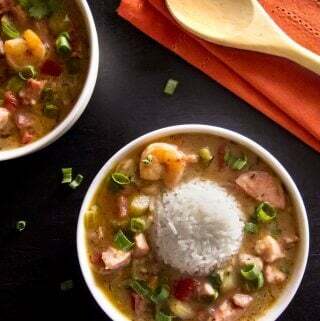 The origins of gumbo go back to the West Africans who were enslaved and brought to the colony of French Louisiana. West Africans used okra to thicken stews made with meat and shrimp. As a matter of fact, the word for ‘okra’ in West Africa is ‘ki ngombo’ and in French it’s ‘gombo’. Over time French, Native American, Caribbean, Creole and Cajun influences created the different varieties of gumbo: thick and thin, with or without tomatoes, with seafood, chicken, or sausage, and with or without okra. There are three ways to thicken gumbo: roux (pronounced ‘roo’), okra, and filé (pronounced ‘fee-lay’) powder, which is made from dried sassafras leaves. 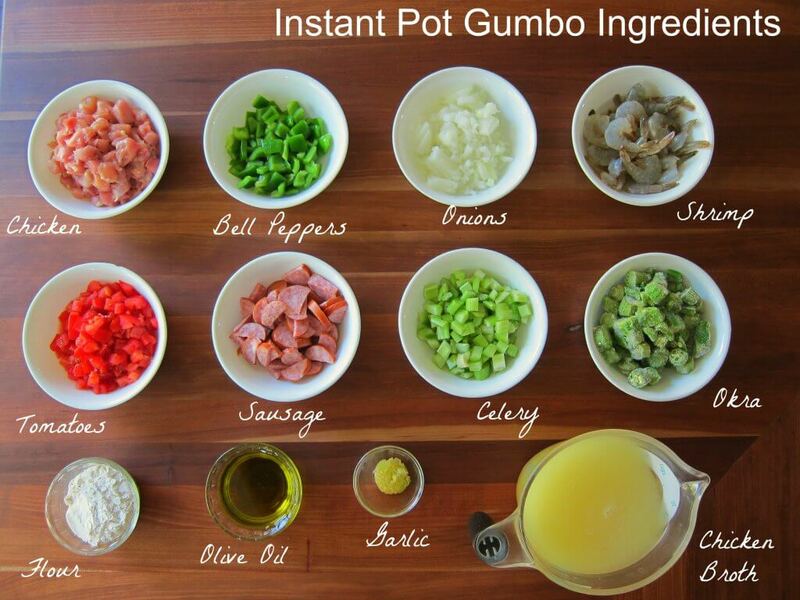 You can use one or more of these ingredients to thicken gumbo. This recipe uses okra and roux. The roux not only thickens the gumbo, but gives it a deep, rich color. I found this interesting article from Serious Eats, detailing the history of gumbo and the use of okra and filé to thicken gumbos. This Instant Pot Gumbo recipe is adapted from an authentic stovetop recipe I’ve been using for years. There are seafood gumbos, shrimp gumbos, chicken gumbos with sausage and even vegetarian gumbos. My Instant Pot gumbo recipe has chicken, sausage and shrimp. You can modify the recipe to include your choice of meats and seafood. Don’t be daunted by the number of ingredients in the gumbo. Just be organized and have everything ready to go before you begin cooking. Traditionally, gumbo is simmered on the stove for hours, but this Instant Pot gumbo recipe will have you eating delicious, hearty, spicy gumbo in less than an hour. One of the ‘rules’ of Instant Pot or pressure cooker cooking is that you shouldn’t add thickeners like flour until the end of cooking. Well, you’re going to break that rule when you’re making this Instant Pot Gumbo. You’ll make the flour-based roux at the beginning and add about 4 cups of chicken broth to pressure cook the dish. Make sure that the bottom of the inner pot has no stuck on bits of food when you begin pressure cooking. 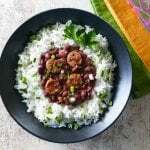 Serve Instant Pot Gumbo over rice – you should try out my Instant Pot Jasmine Rice recipe. 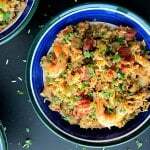 And since you’re looking at this recipe, I think you’re really going to like my Instant Pot Jambalaya recipe too- it’s yummy! One of the most important steps when cooking this Instant Pot gumbo is making a good roux. And this takes a little patience, about 10 to 15 minutes of stirring. If you don’t have the time to spend making this roux for Instant Pot Gumbo, I would suggest that you wait to make it when you’re able to give the dish the attention it needs. Roux for this gumbo is made by cooking equal parts oil and flour. When you make the roux it’s best to get it to the color of peanut butter or even slightly darker. The end result is a rich, aromatic mixture with a nutty flavor. It’s also very important that as the roux gets darker, you stir it constantly and don’t let it burn. A burnt roux will ruin your gumbo! If it’s your first time making the dish, I would make the roux on the stovetop. It’s quicker and you have much more control over the heat than in the Instant Pot. I offer the Instant Pot option for my readers who don’t use a stove. The spices in the dish include black, white and cayenne pepper. I sometimes substitute cayenne pepper with a Cajun or Creole seasoning seasoning, in which case I reduce the quantity of salt. This Instant Pot gumbo recipe also calls for Andouille sausage, which is a spicy smoked sausage. You can substitute regular smoked sausage if you can’t find andouille sausage. If you’re new to the Instant Pot and aren’t familiar with how to use it, please read the Instant Pot DUO Beginner’s Quick Start Guide or the Instant Pot ULTRA Beginner’s Quick Start Guide first and then come back here to learn how to make Instant Pot Gumbo. When inner pot is hot, add 2 tbsp olive oil. Add chicken and sausage and saute until lightly browned, about 8 to 10 minutes, stirring frequently. Using a slotted spoon transfer contents of inner pot to a plate and set aside. Add remaining olive oil and all-purpose flour to inner pot, to make a roux. * You can go darker than peanut butter. The darker the roux, the more intense the flavor of the gumbo, but be very careful not to burn, so stir constantly. Add onion, bell pepper, celery and garlic. Saute until vegetables are slightly soft, about 5 minutes. Stir in broth, tomatoes, white pepper, black pepper, cayenne pepper, dried thyme, salt, brown sugar, worcestershire sauce, lemon juice, bay leaf, frozen okra, and reserved chicken and sausage. Using a wooden spatula, scrape the bottom of the inner pot to make sure there are no burnt bits stuck to the bottom. Stir in Cajun or Creole spice-rubbed shrimp. Close Instant Pot immediately and let the shrimp cook in the residual heat for 10 minutes. Stir gently and sprinkle with green onions and parsley. Serve over Instant Pot Jasmine Rice or a rice of your choice. 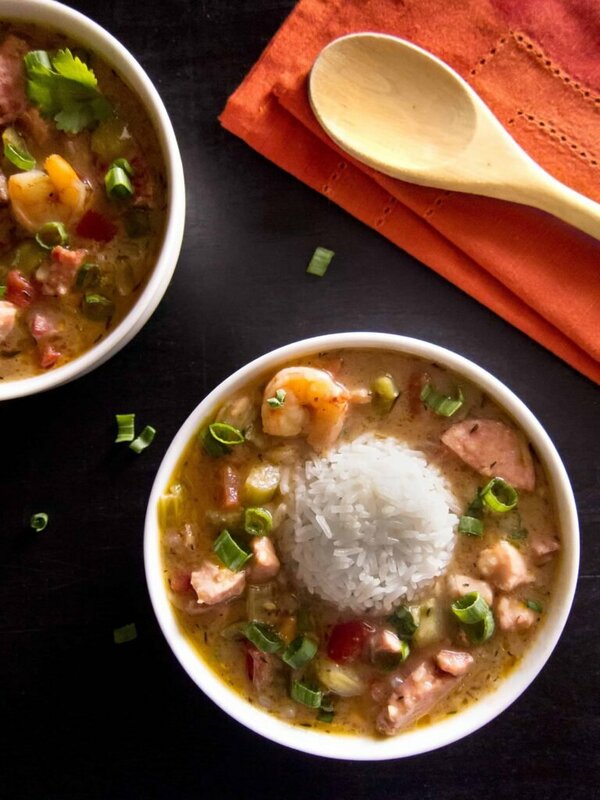 This Delicious Instant Pot Louisiana Gumbo is a quintessential New Orleans dish that is hearty, satisfying, flavorful and perfect for a crowd. Made with chicken, sausage and shrimp, it tastes amazing when served over rice. Rub shrimp with 1 tsp of Cajun or Creole seasoning and set aside. Press 'Saute' and when Instant Pot has heated, add 2 Tbsp olive oil to inner pot of Instant Pot. Add andouille sausage and chicken, and cook until browned, about 8 to 10 minutes. Press 'Cancel' and transfer chicken and sausage to a plate using a slotted spoon and set aside. To make the roux, press 'Saute' and add remaining olive oil and all-purpose flour to inner pot. Add onions, bell pepper, celery, and garlic. Stir until vegetables are slightly soft, about 5 minutes. Stir in broth, tomatoes, white, black and cayenne peppers, thyme, salt, brown sugar, worcestershire sauce, lemon juice, bay leaves, and frozen okra. Stir in reserved chicken and sausage. Close Instant Pot and cook on 'Manual' or 'Pressure Cook' mode for 4 minutes. Immediately stir in the shrimp and close the Instant Pot for 10 minutes. The shrimp will cook in the residual heat. Open the Instant Pot and sprinkle the gumbo with parsley and green onions. Stir and serve gumbo over Instant Pot Jasmine Rice or a rice of your choice. * The darker your roux, the more intense the flavor of the gumbo. But be sure not to burn the roux, so keep stirring constantly especially as it gets darker. It's quicker to cook the roux on the stovetop. 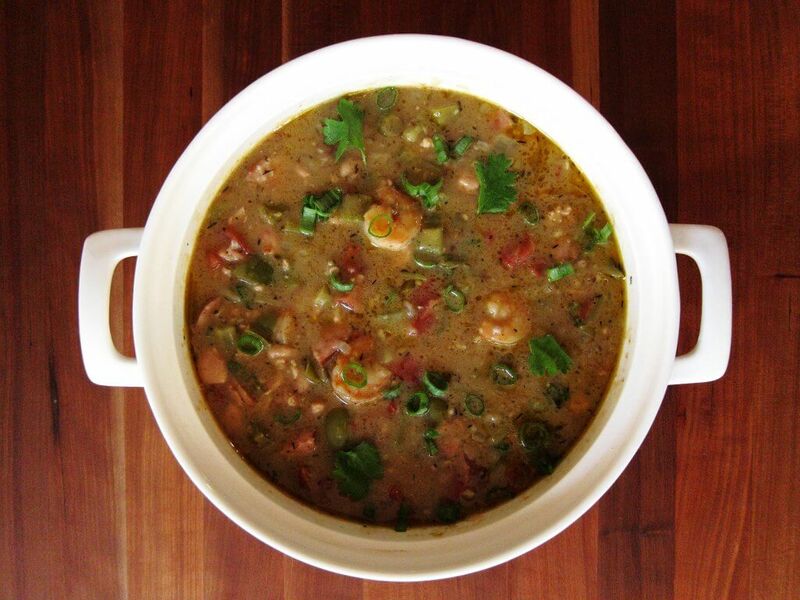 That’s a great essay on gumbo and an awesome sounding recipe. There’s just no getting around the ingredient list to make a decent gumbo! Love the use of white, black and cayenne pepper and the chicken thighs. Nice!. Thank you Romain. I take it as a great compliment coming from you – I love your blog and your recipes! I love the way you present your recipe. definitely going to try this one!! Thank you Kath! I hope you like it. This sounds great but can you please say how spicy hot it will be on a 1-10 scale, thank you. Hi Noreen, I have a pretty good tolerance for spiciness and I don’t think this is very spicy – I would say 4 or 5, maybe. If you’re sensitive to spice, reduce the cayenne. Then before adding the shrimp, taste for spiciness and sprinkle some extra Cajun or Creole seasoning. Let me know if you try it out. Delicious gumbo, Neena! I agree with heat index…about a 4 or 5. I used a mix of canned, crushed Roma tomatoes and some fresh chopped…and had fresh okra on hand instead of frozen. Okra is a bit squishy for my taste but other veggies combined to make a great compliment to the shrimp, chicken and andouille. Yum!! Thanks for letting us know how it went, Jan – I’m really glad you liked it. I wonder if next time, you could add the fresh okra in with the shrimp. I bet it would cook to your liking in the 10 minutes. Or you leave out the okra initially, do a quick release, add in the okra and pressure cook for 1 minute and proceed with the recipe. Made this today. Very first thing to make in my InstantPot :)it was delicious! My husband and I visit New Orleans every spring, we love the city, the people, the melting pot of culture and of course the food. We both loved this and plan to keep this recipe in heavy rotation in our home. Hey there Andrea – wow, you’re impressive because the first thing I ever made in my Instant Pot was boiled eggs! I love the Big Easy too – such a unique city and oh, the food! I am so glad you liked the recipe. I think you’ll like the Jambalaya too. Similar ingredient list, but no roux to make, so it’s quicker. OMG!!! mY KIDS SURELY LOVE THIS thing, YOU MAKE IT VERY COLORFUL AND KIDS EVER HAPPY TO EAT SUCH THINGS. iLL DEFINITELY TRY THIS RECIPE. Thanks Kelly! Do let us know how it goes when you make it. cook on Manual on high or low pressure for 4 mins? Thanks. Enjoy all your colorful recipes. Sorry to be lame I’m new to the instant pot but how can you cook the roux for 15 mins if you have turned off the pot? Mine is just sitting there…not cooking. Hi Betsy – no, not lame at all. As a matter of fact, I’m lame! In the step by step instructions with photos, I mention that you need to press Saute again. In the recipe card, I did not say ‘Press Saute’ in the beginning of Step 5. My bad, I’m updating the recipe card right now. Hope you figured it out, sorry! Hi! 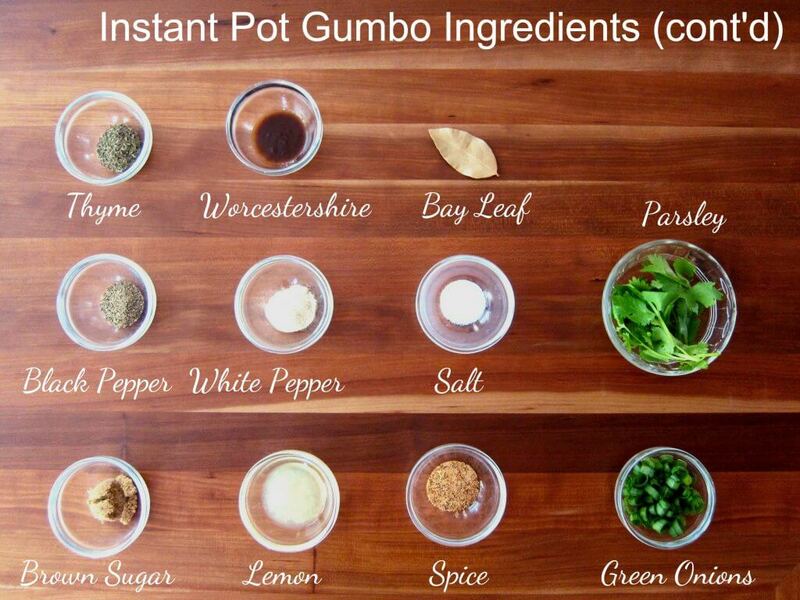 As a New Orleans girl, I’m so grateful to have found gumbo adapted to the IP! Thank you, thank you! Quick question: what size is your pot? Hi Casi – I have a 6 quart. Hope you enjoy the gumbo. We found this extremely hot. I’d reduce cayenne to 1/2 two. Other than the heat, very tasty. Hi Dawn – Sorry to hear it was too spicy for you. Hope that next time, you’ll be able to enjoy it more by reducing the cayenne. Thanks for sharing. Any recommendations for flour substitute? Love gumbo but my husband is gluten-free. Gumbo usually takes all day for me because I cook the roux for an hour and get it dark, like chocolate. Ready to try this one. Hi Jo – thanks for your question. Hmmm, I would recommend a gluten free flour except that since I’ve never tried that, I’m not sure how it would affect the pressure cooking i.e. if it would scorch on the bottom. Conventional wisdom is to not use flour in the first place, due to fear of scorching. However I tested this recipe to find the optimum amount of liquid to prevent scorching. If you feel like experimenting, you could try it out. 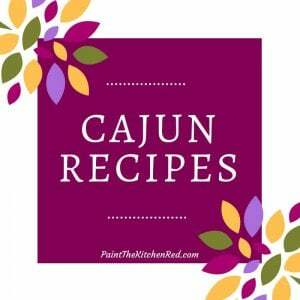 The other option is to omit the roux step, increase the okra and add some gumbo file powder after cooking is complete – about a tablespoon or so – to thicken the gumbo. You could also reduce the quantity of liquid a bit. Good luck! This was a delicious recipe. I increased the cayenne to 3 tsp and added a fresh jalapeno with seeds. I love it spicy! Made it for my family. We are all from south Louisiana and absolutely loved it. I didn’t understand the brown sugar though, but I added it anyway. 🙂 Great recipe and thanks! This made my life easier. @Jo Parks, you might try using flaxseed flour. I used it when making fried foods and it’s really tasty. I’ve never tried making a roux with it, but it’s worth a try! Hi Chris – yay! I’m so glad you liked it. Oh, yeah, about the sugar: I like to add a tiny bit of sugar to some recipes to balance out the flavors esp spice and lemon juice. It’s the Indian in me! You could definitely have left it out. Thank you for your comment! Jo – please check Calah’s comment for gluten free details! This recipe (with slight alterations) is now in rotation in my household! Never though of attempting gumbo in the pot! It’s so much quicker and still has an amazing flavor! Thank you!! I made it GLUTEN FREE and my alterations/ tips are below. @ Jo Parks — Hello my sister is gluten-free as well and I made this for her last night and it was AMAZING; couldn’t even tell it was GF. I used Krusteaz gluten-free all purpose flour and ended up with perfect gumbo. (you will most likely get different results with a different flour, I’ve been cooking gluten-free for years and found Krusteaz to be the closest 1:1 for roux and anything being used as a thickener.) However I too like a dark roux so it took 2 1/2 saute cycles (1hour15minutes) to get it where it needed to be. Also after 20 minutes not having the best results with 1/2 olive oil and 1/2 flour; I added 2 tbsp ghee(you can use butter, lard, or grease) and about another 1/3 cup flour to the mix and it worked like a charm! I also doubled the okra mainly because it helps with the texture but also because its delicious! And getting the right texture for gluten-free is a must! Keep in mind that gluten-free flours do stick easier so if there is anything stuck to the bottom of the pan after cooking meat deglaze with some wine/broth/water; which ever you prefer. It would definitely be easier to make the roux on the stove top then add to the pot and would take less time if you would prefer that method. Either way keep in mind gluten-free flour burns easier than regular flour so you’ll have to stir more frequently. Hope this helps. I used the regular saute function instead of more so that may also be why it took so long. I did not read the comments before making it but will try again next week and see if that changes things. Hi Calah – wow, so kind of you to post your gluten free adjustments! I learn new things every day – thank you for sharing. I’m really glad you liked it. I’ll try and bring this to the attention of reader Jo Parks. @CalehMac. Thanks so much. Your information is so great. My hubby will be so glad to have gumbo back. I have made it without roux, ? , and with rice flour, ?. It’s finally getting cool in Texas so I see gluten-free gumbo on my menu for next week! Thank you, PTKR for the instant pot version. Becki – Oh, I think you’re going to love it with the meat! 🙂 Thanks for commenting, so glad you liked it. Oh my goodness. I love Cajun food and have made ettoufee before but it’s been a while. I’ve never attempted gumbo not sure why. But this was AMAZING. And I usually skip all the pre recipe jargon but for some reason I read this time. Your explanation of making a good roux and the history of gumbo sold me on trying your recipe AND It was so yummy I had to write a review. Thank you so much for sharing. Alicia! thanks so much for commenting and I’m glad the mumbo jumbo about gumbo was interesting to read 🙂 I do enjoy giving a little history about a dish if there’s something to say! So glad you liked the recipe and your taking the time to comment is very much appreciated. To make a good dark roux, it takes a lot more than 15 – 20 minutes. 🙂 What I do, is make it in my toaster oven. I found this information in a really old cookbook that I found in the French Quarter. Use equal parts flour & oil (you can use bacon grease), I usually use a little less oil… Whisk in an oven proof pan, stir the sides with a spoon several times while whisking. Then place your pan in the oven, and whisk every 15 minutes until you reach the color you want. No more standing & stirring for an hour or so. Turns out great, no worry about burning. I freeze whatever I have leftover to use later. Thanks so much for your tips about making roux, Nancy. I do my best to write all my recipes in such a way that the entire recipe can be made in the Instant Pot. That being said, there are times when a stovetop or oven could work better for parts of the recipe. Your tips would work great for someone who would like to do that. I would like to try this but can you please elaborate on the toaster oven settings? Gumbo does not have tomatoes. Thanks for taking the time to comment – the tomatoes can be left out and you should be just fine proceeding with the rest of the recipe if you wish to try it out. You’re a genius!! I just tried this recipe…the 4th thing I’ve cooked in my Instant Pot. This was the most amazing gumbo I’ve ever tasted!!! Thank you so much! Haha, it’s always a good day when I get called a genius 🙂 I’m really happy you enjoyed the recipe and am very appreciative of you taking the time to comment. This was an unplanned meal so I used what I had on-hand. Lots of shrimp, probably 2 lbs, Earl Campbell smoked sausage and no chicken. I had only chopped red & yellow sweet bell peppers in the freezer. no celery and no okra. (Did I even make your recipe? lol) I omitted the cayenne because we’re wimps. None of that even mattered because it was some awesome gombo-less gumbo! Thanks for a new recipe in the rotation. Lol, I’d say it’s still gumbo 🙂 Maybe next time, you can try it a different way. Glad you enjoyed it, Debbie! After sauteeing the chicken and sausage. I had some brown bits on the bottom of my pan. Following the recipe, I went straight to making the roux. But then once I had all the ingredients in, my Instant Pot wouldn’t come to pressure. I eventuallly realized that I had scorched the bottom. I moved the ingredients into my extra nonstick liner and then was able to bring the mixture to pressure and finish. In retrospect I should’ve deglazed after sauteeing and before starting the roux. My family enjoyed the final product and next time we’ll probably add more cayenne to make it spicier. Hi Mary, I’m glad you were able to salvage it. Yes, it was probably what you suspect. It is important to make sure the pot has nothing stuck to the bottom before bringing it to pressure. Thanks for commenting. I made the Gumbo last night for dinner. Your instructions were easy to follow and it turned out beautifully. I was concerned about the heat level with so much pepper. I only added 1/2tsp cayenne pepper. It was still a little hot for my husband and myself. I will make it again but cut pepper amount in half. But it was still delicious! Hi Mary – thank you for your comment. Sounds like your heat tolerance is less than mine 🙂 I’m really glad you liked the recipe still! Thank you for this recipe! I am having so much fun cooking and trying different dishes with the Instant Pot! This one is awesome! one thing to note about the Roux (probably for me more so to practice) was it started to stick to the bottom of the inner pan which cause it to give a ‘burn’ code. It basically means you have to scarp the bottom so you can continue to pressure cook. so in the future I suppose I won’t brown the roux too much XD – lesson learned. Again thank you and I am looking forward to future recipes to try! Hi Patrick – thank you for your kind words! The newer Instant Pots seem to be a bit more sensitive to hot temperatures. In prior models, we get the ‘hot’ message but it’s just informational. In your case, as long as you deglaze well and let the Instant Pot cool down before adding the liquids and remaining ingredients, you should be fine to begin pressure cooking. Rather than undercook the roux which is really important to the flavor of gumbo, I would suggest (if you have the option of using a stove) that you make the roux in a saute pan on the stovetop. You won’t regret it. The other option is to cook the roux on medium heat on Saute mode, if you’re using high heat currently. All the best! I was wondering if I could get some advice – I keep getting the ‘burn’ notice during the pressure cooking stage. I actually didn’t make that dark of a roux, only about 10min stirring, definitely didn’t burn, and scraped the pot afterward. After the burn, I cleaned out the pot and tried twice more, with same result. Is the type of flour used important? I used plain white. Can you add the roux at the end so it doesn’t burn? Or should I dilute more with stock? Is there a slower way to heat up the pot? I’m using a 7-in-1 Duo60. Thanks! – After sauteing, completely deglaze with 1/4 cup broth and turn the Instant Pot OFF. Transfer contents (i.e. roux, onion, celery mixture) to a bowl and let the IP cool down for 5 to 7 minutes. – Add in all ingredients starting with the broth, but put the roux and tomatoes on top of all the other ingredients and don’t stir. – Proceed with the recipe. I want to try the last suggestion too! a couple of other people had mentioned to add the tomatoes towards the end and not to stir it so it doesn’t go to the bottom. I will definitely try these too! Thanks Patrick – do let me/all of us know how it goes. You have a great weekend. There are only 2 of us. Any problem cutting the recipe in half? Rose, although I haven’t done it myself, I don’t think there would be any issue with halving the recipe. To solve the challenge with roux: make the roux by baking the flour in an oven proof skillet until the color of cinnamon. To do this set oven to 425 degrees. Bake for 40 – 45 minutes; monitor color as you near the 40 minute mark to make sure it doesnt get too dark. Add baked flour to liquids whisking until smooth; add liquids as noted above. Personally I would saute the onion, celery and bell pepper before adding in the liquids. The only oil you would need is what is required for sauting the meat and veggies. Thanks for sharing, Suzanne! I try to give instructions so the entire dish can be cooked in the Instant Pot because that’s what many people want. However, the oven and stovetop are great alternatives. The good thing about using the method you describe is you can do it and store it for future use! That’s one of the most awesome tricks I’ve heard yet. No fuss, can focus on other things, can make more to freeze or use later, etc. No oil at this stage means longer shelf life, too. Thanks for sharing! Will try this trick ain this recipe today. I had the issue with my cooker where it was thinking it was up to pressure and actually wasn’t. Seems that the roux must me creating a panacia(sp?) on the bottom insulating it. Tricking it into thinking it’s up to temp where it really isn’t. I got around this by constantly scraping the bottom as it was heating up until it was bubbling. Then placed the lid on and everything seemed to be fine after. Just a not in-case someone else gets the same issue. Hi Bryan – thank you for sharing your experience. It’s always helpful. If I am just doing chicken thighs & sausage is it 4 min. or do I increase the time? Delilah – If you’re not adding shrimp don’t increase time, but go ahead and do a 15 minute NPR (Natural Pressure Release) or you can even let the float valve go down on its own. Your recipe needs to reflect a realistic prep time. 5 minutes in no way covers dicing all those vegetables and chicken, peeling and deveining shrimp, and assembling all the spices. Otherwise it turned out fine. Hi Patrick, I note on the recipe notes: “Prep time does not include steps that are already accounted for in the ingredient list, e.g. chopped onions, minced garlic, diced chicken, etc.”. I also mention this on my about page. Prep time is subjective – some use prepared ingredients e.g. peeled and deveined shrimp, etc. It’s just the recipe-writing convention I’ve chosen to account for the variability. I appreciate your point of view and thanks for commenting. This was my first attempt ever at making gumbo and this was delicious! I didn’t have any lemon juice or cayenne pepper. I subbed hot chili powder and red pepper flakes. Is the roux supposed to get thick? I cooked it for 20 minutes and didn’t seem to thicken. I also used frozen, pre-cooked shrimp instead of fresh. I finally added the rest of the veggies and continued on. I will definitely be making this again. My husband said it was really good. Hi Cindy – glad you liked it! Yes, the gumbo does thicken some but should be easy to stir; the color is the important thing. You’ll like the Jambalaya too and this week I’m posting Red Beans and Rice. After at least 20 minutes I couldn’t get the roux to thicken, but definitely got the coloring right. I ended up just going ahead and adding the veggies and it seems as if the roux thickened up then. Then I couldn’t get it up to pressure to cook for the four minutes because I got the burn error. I just scraped the bottom and tried to get it up to pressure and it worked. Other than that, this was the bomb. Thanks! Hi Tiffany – glad it worked out in the end, but sorry you had trouble with getting to pressure. If your Instant Pot is a newer one, it could be you need to change the method. Next time, I suggest you make the roux on the stovetop in a skillet, add the liquid to the instant pot first and add the remaining ingredients, with the tomatoes and roux going right on top without stirring. New Orleanian here! Thought it would be great to be able to do a gumbo in the instant pot without having to slave over the roux so I gave it a shot and wanted to share my results since I ended up veering from the recipe. We have the Crock Pot version of the instant pot, and try as we might it would not thicken the roux the way it will when I do one on stovetop. I ended up transferring it to a pot and adding the additional 1/3 flour that one of the other commenters suggested, along with some butter. Soon as I got it into the pot it turned the right color. Our instant pot does not have a perfectly flat surface at the bottom of the pot (it raises up a bit in the middle) so I wondered if this could have been at fault. After doing the roux stovetop, added it back to instant pot with other ingredients and file gumbo, which we basically would be shot without adding that to our gumbo back home 😉 Super delicious results, with much more kick than the recipe that my grandmother taught me! Hopefully this can be helpful for others using the same pot as I did. Thanks for the recipe, Neena! Hi Colette – thanks so much for the detailed comment; I’m sure it will help others. I would say that the stovetop roux takes less time, for sure but I was able to get the roux the right color with more time in the Instant Pot I own – it could be that the shape is different, as you suggested. I’m glad a New Orleanian gave the recipe a thumbs up! I decided to treat myself this past weekend and make this gumbo. I bought everything for pretty cheap at my local Aldi. It was a little labor intensive but I don’t mind that at all. The only thing that was way off was the instructions for the roux. I cooked and cooked it and ended up turning the heat up. After an hour I gave up when the roux was just peanut butter colored, not dark. From reading the comments I will make the roux on the stove next time, seems to work better. Other than that I absolutely loved this recipe. Will continue to make it at home. The spice level is perfect and is a great dish to make for leftovers. There’s no tomatoes in a real gumbo. Not enough cajun seasoning. and if you cut your chicken and veggies into small pieced the pressure cooker will pulverize them into nothing. I prefer more of a pulled chicken effect. using larger pieces and them breaking them up after cooking. I don’t think okra will work the way you’re doing it. Okra oozes as it cooks. If I’m using okra I put it in after pressure cooking and let the soup simmer for 1/2 hours. Otherwise they practically disappear from the pressure. Hi Arty, I make this recipe quite often for my family (and that’s why it’s on the blog; I only post what my family eats and loves). I find that the seasoning is perfect for us. The chicken is not overcooked and neither is the okra. Sounds like you already have a recipe you like. But if you decide to give mine a try, let me know what you think. Hi, I’m hoping you can help and tell me what I did wrong. I cooked the roux on the stove to a dark brown color..it went perfectly. Other than that, followed you recipe closely. When it was done, it was so oily. The oil sat on top of the gumbo, it’s like it didn’t mix in (and even if it had, it would’ve tasted bad because of the sheer amount). What did I do wrong? The gumbo also has a very soupy consistency, rather than thick, stew like consistency? Hopefully you can help. Love your recipes! Hi, I followed your recipe exactly other than just making the roux on the stovetop from the get go based on all the comments I saw. It took a while for the pot to come to pressure, but it eventually did without the Burn message. The gumbo ended up being incredibly oily..it almost seemed like the oil and the soup portion did not mix? Even if it had, I feel like it would’ve been incredibly oily. My gumbo also had a very soupy consistency, rather than the regular stew like consistency of a gumbo. Do you have any tips on fixing it? Or maybe what I did wrong? Currently I’m cooling it in the fridge so I can take the excess fat off the top when it congeals. Hope you can help. I love your recipes, this is the first one that’s given me any trouble. Hitee – looks like your roux separated. I’m not sure why this happens, but here’s an article I found, maybe it will help you. https://www.chowhound.com/post/gumbo-roux-separation-oil-rising-woes-688868. I feel that you could try and let it boil a bit and it might incorporate again. I hope you’re able to salvage it. For anyone that may go through this.. I was able to salvage the gumbo last night. I let the fat congeal overnight in the fridge and scraped it off the top, then tried to get as much liquid out as I could and cooked it for some time, mixing and using an immersion blender to hopefully see the results I wanted. This worked, but I was still seeing some oil so I poured the liquid into a fat separator and poured the oil out. Then I combined the liquid with the gumbo and used a bit of corn starch+water to make it thicker. My husband said he’d pay for it at a restaurant (high praise lol). Thanks for the recipe. Hopefully my next time cooking it will be even better. Hitee, thanks for sharing your experience. It’s frustrating when you have to go through so much extra work! Next time, try and cook the roux on the stovetop. It not only cooks faster, you can control the heat. Tried your recipe for the first time. Made the roux on stove top which turned out great and darkened more than the color of peanut butter in 25 minutes of cooking and stirring. i pretty much doubled your recipe as i was cooking for a seafood gathering with friends (25 people). having a 14 qt pot is nice. Used all ingredients along with some gumbo file which is hard to find in stores in Virginia. Needless to say this was the talk of the night. I soaked up all the compliments your recipe had brought me that night. Thanks for making this night a success. Hi Rick, thank you for taking the time to comment – it was a great start to my day! Wow, that’s a big pot you have; what a great way to feed so many people. 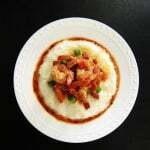 I’ve just posted a recipe for shrimp etouffee that you might like too! You like spicy, you’ve come to the right blog 🙂 Thank you for sharing, Rick. I love this recipe. I actually bake my flour in the oven which eliminate the oil required when you cook it on the stove top. Saves quite a few calories. We discovered this technique years ago watching America’s Test Kitchen. I’ve had a few people tell me they use this method for cooking roux. I try to post recipe instructions where people can make the entire recipe in the Instant Pot, since some people don’t have access to stovetop or oven. But I think it’s a great way to make roux – thanks so much for your comment, Suzanne! WOW! I really did it. I am not only very new to cooking, just started this year when I retired, but this was the 1st time I used my InstaPot. The Gumbo was terrific my wife and I couldn’t stop eating it. Like many of the other comments my only problem was I couldn’t get the roux to thicken. My wife told me not to worry about it because she thought the it tasted prefect. I don’t want to do the oven thing. Do you think I should try cooking it longer, I went 20mins? Any other suggestions I am making it again tomorrow. Tom, because of the issue of recipes sticking to the bottom of the Instant Pot when starchy ingredients are present, the quantity of flour has to be limited when you make the roux in the Instant Pot, and that can cause the roux to be less thick than you might like. Otherwise, I would have suggested increasing the flour to oil ratio. You might also try to cook the roux on the stove… Or how about adding a thickener at the end? When I make this, I just go by color usually. I’m so happy you and your wife liked the recipe. I also had a problem with the roux breaking and the gumbo being too thin, though it was still delicious. has never happened to me before, but I’ve never tried to make a roux with olive oil – could that be it? Hi Erica – I actually like the thickness of the gumbo as is, but you could try using butter and see if that works better for you. Do let me know if you try it out. Thanks for your comment. Can you substitute olive oil with coconut oil or even vegetable oil? Hi Lecia, I’m not sure about coconut oil and its interaction with flour. I believe vegetable oil should work fine. Good luck. Maybe I missed it, but I’d suggest you include instructions on how/when the addition of the roux should take place. As a easy shortcut, in many parts of the country (I’m in Texas) one can find an off-the-shelf roux that works very well. Here in Southeast Texas a great brand is Douget (“DOE-gay”) roux. Great recipe otherwise! Hi David, thanks for your recommendation – that’s really convenient. btw, in my recipe the roux is cooked after the meat is removed. The remaining ingredients are added to the roux in the Instant Pot. I got the dreaded “burn” warning on my instant pot but the recipe still turned out absolutely delicious. I couldn’t stop eating spoonfuls right out of the pot. Thank you! 4 star rating because of the Burn factor, wihch is more due to the pot than the recipe. I can’t tell you enough how absolutely happy I am with your NO gumbo recipe. I make gumbo all the time (what a hassle) and I will never make on the stove top again. This is one of the best gumbo’s I’ve ever made. I did doctor it up a little but I don’t think that would matter. I made the roux in the pot too! Thank you and this is coming from a past resident of New Orleans. Judith, I’m always happiest when I get positive comments from NO folks! Thanks for your comment and hope you get to try the other New Orleans recipes, especially the jambalaya, and tell me what you think! Huge success! Perfect thickness. A new method for a great classic. Thank you, Lisa! I’m happy to hear it worked out for you – I appreciate the comment. I made this for someone. He hasn’t tasted it yet and I’m allergic to shellfish. I kept getting a burn message. So I moved it to the stove top. I will try again. I printed out the recipe but didn’t read the bottom for the tips. Next time I try it I will follow all of the directions LOL! If you kept getting the burn error, your Instant Pot is probably running hotter than mine. Next time, I would make sure the inner pot cools down before pressure cooking and I would also add some extra liquid. You could remove the roux and veggies and then layer them on the other ingredients without stirring. Cant wait to try this. Probably this weekend. My only comment/question is I notice an absence of filet gumbo powder in the ingredient list. We’ve always enjoyed that spice when added at the end. You don’t use it in your gumbo? Hi Phil, so there are 3 ways of thickening gumbo: okra, file and roux. You can use any of these to thicken it. In general, you wouldn’t use both okra and file. I’ve chosen to use okra and roux. This article about the three is very interesting – Gumbo: Roux, Okra, Filé or All Three? Hope that helps! Just a suggestion since it’s your first time making it in the IP, you might want to make the roux on the stovetop – it’s faster and you have more control. I made this recipe and my husband and I both loved it! Great flavor and so easy. I choose to make the roux on the stovetop since it was my first time making it. It turned out perfect. Thank you for the detailed directions and the recommended steps for first timers. I give this recipe 5 stars! I’m originally from the Gulf Coast of Texas and grew up on gumbo. But now I live in the Great White North of Canada. I made this for my family tonight (for Mardis Gras! ), and it was delicious. I made a few changes, subbing in crab for the chicken, veg broth for the chicken stock, and veggie andouille sausage for the pork one (added with shrimp), as we don’t eat land meats. Even with those changes, this was reminiscent of the gumbos I had back home. I will definitely be making this again. Aww, thank you Rachel! I’m really happy to hear that you enjoyed the gumbo! andouille. I got your website address from the man who made it and brought it to the potluck. I can’t wait to make it myself! Thanks so much for this authentic Gumbo recipe! Marla – wow, I love comments like yours where my recipes are being made at gatherings – thanks so much for sharing! I do hope you get to try it out.